The past week has been pretty fraught for many of my friends. I have also been struggling. I post this reminder that we need to help each other. Support each other. That in order to banish darkness, we need to have more light. 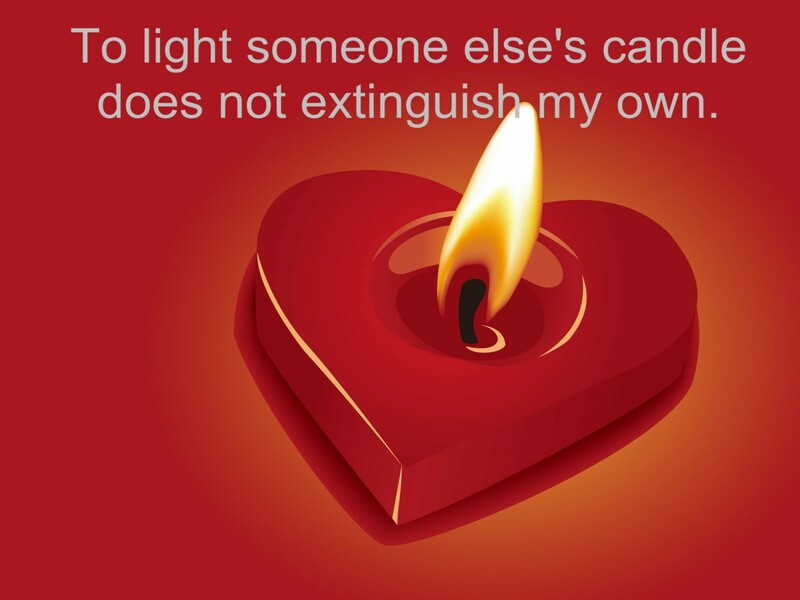 Using our light to light someone else's candle costs us nothing. Zero. Be kind. Share the light. My dining room this morning. Foreground - last of the green shawls being fringe twisted. On chair - shawls ready for wet finishing. In bucket - four shawls to be fringe twisted. On bucket - stack of table runners needing to have their tags attached and pricing affixed. What is just out of sight on the blue chair is a stack of knitted shawls that need to be blocked. Waiting in the wings - my chequebook to be reconciled to my bank statement, stack of bills waiting for cheques to be written. Then a trip to the bank to pay them. In the studio - well, lots more, because I'm still trying to weave more for craft fairs. But also a box of homework to be packed up and mailed. And, oh yeah, mark to be submitted to the college - next on my list, I guess. One of the reasons I keep track of how long it takes me to do tasks is so that I can allocate my time in order to get everything done that needs doing. 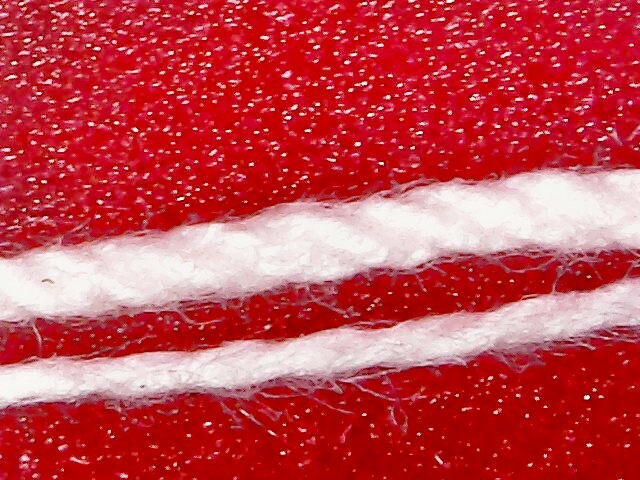 The creation of textiles is labour intensive. It takes time. Lots of it. Right now I only have so much energy so I have to conserve what energy I do have in order to focus on the things that require being done on a priority basis. Weaving (designing, preparing warps, dressing the loom, actual shuttle throwing) is just the first in a long list of steps. Dry finishing. In the case of shawls and scarves, fringe twisting. Wet finishing. Getting things through the washer/dryer (or done by hand, as appropriate). Then further dry finishing such as hemming. And then a 'final' press. For the twisted fringes, a final trimming of the fringes. Last but certainly not least, tagging with legally appropriate cleaning instructions and fibre content. And pricing. I work in batches because once I have my work station set up it's just a whole lot easier to get all of that bit done before I clear the decks for the next task. So this morning I finished fringe twisting the green shawls, then cleared the table so I can deal with banking. The end of September marks the end of the third financial quarter of the year. I have to report any GST (goods and services tax) collected and paid out. I also need to review my finances because I have been carrying debt (travel and show fees) and need to make sure I can pay the current crop of bills. But in order to report the GST I have to finish entering my financial records into my ledger, balance it and figure out the figures to submit. Not my favourite job. So I keep track of what needs doing and try to keep the work flow logical. And timely. I have been weaving long enough that I was part of the growth of weaving in the mid-70s, part of the shrinking of practitioners, part of the recent growth in interest again. As such I have a library of books that span all of that time. One of the things the level one Olds students do is write a comparative book review - comparing two books to the course curriculum. Mary Black is frequently one of the two. Also Debbie/Deborah Chandler/Redding. Mary Black wrote her book in the 1940s. It was always intended to be a textbook, and it is reflective of the time it was written. In other words, it's dated. By the time Redding's Learning to Weave was published I had already been weaving for quite a few years and I didn't see the need to purchase a beginners book, so I don't actually own that one. My weaving class textbooks consisted of Mary Black's book, Shirley Held's book Weaving and M. P. Davison's green book. Regensteiner's book was also recommended as additional reading. So those were my first books. Over the years as I learned more, I bought books to add to my library. As I gained in knowledge, I fine tuned my interests and bought more specialized books. Since I had a connection to Sweden, several of my books were purchased - originally in Swedish - reflecting that interest. I also bought English books, partly because they seemed more...technical...to me. Since I was interested in weave structure, I wanted to know more about how threads could move through the cloth to create pattern. The above photo is just a very small selection of books from my library. Some I rarely use (the Regensteiner, for example) some are used infrequently, but consulted for specific information, some I just can't bear to sell. Yet. What these books have in common is the variety of weaving terms that get used. There is not a standard language for things. Or wasn't, when I began. With the growth of the internet and the popularity of Handwoven, weaving terms have swung more and more towards American usage. Someone commented recently that Mary Black only used the word 'sett' to refer to the colour order of a tartan. That's because she tended to use 'set' for the number of epi/ppi, not the American 'sett'. If you look through Black's book she always refers to epi, never to 'sett' to indicate density. Having a broad based approach to reading books, I am familiar with the many varieties of terms - portee and pourrey cross, for example. Heald instead of heddle (British vs American usage), batten instead of beater (ditto), woof for weft (woof now being referred to as 'archaic' usage). Other cultures have different approaches to weaving. Swedish weavers don't have 'names' for all the different overshot patterns that Davison lists in her book - or Black in hers. Instead they tend to group weaves by category of structure. I'm sure other cultures with other languages probably show similar differences. But I don't speak those other languages, so I have to communicate in English. On the other hand, I am Canadian enough that I well remember that the 'proper' spelling of colour is, well, with a 'u'! Lately I have noticed that more frequently we are seeing dying being used instead of dyeing. I'm sure it is a combination of auto correct (or auto carrot as one person I know says, or auto INcorrect as a friend and I call it) plus a lack of knowledge on the part of editors who either don't know or don't realize that dye in the past tense is actually dyed and that while dying is a perfectly good word it doesn't mean to add colour to yarn/fibre/cloth! Having an editor who actually weaves was very important to me. I didn't want someone who really didn't understand the craft cutting the manuscript indiscriminately. Having an editor who not only understands the language of weaving, but also has familiarity to the processes meant that we could cut right to the chase - make sure that my words were as clear as we could make them for others to read. I am on tenterhooks right now as she finishes doing the part I could not face. I am trying very hard to be patient while she does what needs to be done. My schedule for Sept-Nov was such that if I were doing this by myself I couldn't have touched it anyway. So having someone else work on it means that we are still on track for publication in early Dec.
As I was twisting the fringe on a shawl this morning I started thinking about how fragile the web is when it is cut from the loom. The threads are no longer under tension. The threads can easily be pulled out of alignment. Slippery yarns like this rayon can slither and slip. The weft yarns don't want to stay where they have been placed but start to fall out of the web entirely. Once the fringe (or raw edge) has been secured in some way, things are better but the cloth still won't - can't - perform its function properly. The threads, warp and weft, are still individual. They have no cohesiveness. No strength. They are interlaced but that web has no structural integrity. It is fragile. Weavers have to wet finish their results just like potters have to fire their bisque, glass workers have to anneal their glass, etc., etc., etc. Almost every craft I can think of has to 'finish' their product in some way before it is finally done, done. Textiles have been used for centuries as metaphor for life. In some versions Hansel and Gretel use a ball of yarn to mark their path through the forest. Sleeping Beauty pricks her finger on a spindle. Rumplestiltskin spins flax into gold. The Swan Princes have to have their curse broken by their sister making a dozen shirts of nettle And so on. I look at the web of my life and stand here, near the end of my warp (so to speak) and pick out this thread and that, threads that I had no idea would be incorporated into my life when I set out on this journey. I have met wonderful people, made dear friends. Been to lovely places. Enjoyed conversations that ranged from quantum physics to the history of language. I have been welcomed and treated royally. People seem to enjoy my writing - something I dreamed of as a child but never imagined would become any sort of reality for me - blue collar poor, living in a geographically remote location. And yet. I traveled to Sweden (by freighter, across the Atlantic in May, which was...interesting), took a bus tour of Europe, toured England, visited Sweden several more times, have been to Greece and Istanbul (only 24 hours in Istanbul, but still). I have been to nearly every province in this country (still a few more to get to) and many of the US states. This blog is coming up to 1.5M (Million!!!) page views. I've published books, created educational weaving 'kits', done not one but two DVDs. I've attended - and organized - conferences, sold my weaving wholesale, worked for a fashion designer, done 'ghost' weaving for others. I've had the privilege of transcribing interviews (WeaveCast, Tien Chiu and others) and been interviewed for podcasts. As a child I grew up thinking I was fragile. That I'd never really amount to much. But through the challenge of creating textiles, I seem to have 'finished' myself. Into something "not fragile". One of the things that really appeals to me is how the threads march steadfastly in order as I weave them into the cloth. Yes, I know about the threading error in that block. No, I'm not going to 'fix' it. It won't affect the function of the cloth and I have decided to accept it as my unique maker's mark. Yes, I know I'm lazy and I should have re-threaded 2/3's of the warp to fix it. No, I didn't feel like it. Which just goes to prove that I am not, and never will be 'perfect'. Yes, I know some people will judge me. That is their prerogative. I have spent many years of my life making sure every textile I produced was 'perfect'. IOW, without obvious error. However, there comes a time when another part of you says, you know what? I don't have the time or energy for that level of 'perfect' for this warp. When it came to this warp, I felt ill (from the adverse effects of the 'miracle' cancer drug I'm taking) and I had a brain blip. When I finished and had four 'extra' threads left over I was pretty sure I had made a mistake, went ahead to sley, tie on and start weaving. If the mistake had been closer to the left hand side of the warp I probably would have sighed, taken the warp out and fixed it. But it was much closer to the right hand side and I just Could Not Face re-threading that much warp. For a mistake that really wasn't going to adversely impact the cloth's function. It was also smack in the middle of the spring teaching trips and I just did not have the energy to deal with it. Instead I decided to just accept the fact I could not deal with fixing it, that this warp was going to have a flaw - just like it's maker. With all my wrinkles, excess poundage, aching muscles and joints. On the other hand, this warp is bringing me a lot of happiness. In spite of the mistake. In spite of the flaw. Just like I hope the towels will bring their future owners happiness. After much delay while I worked on other stuff, I think I'm at about the halfway mark. The loom is finally behaving - mostly - within tolerable limits - and I am going to try to weave as much of this warp as possible. Because if I can bring the towels on my next trip to hem in the evenings, that would also make me happy. And I will continue to enjoy the order as I lay the weft threads in and beat them into place. These are Color Catchers. Today I've been wet finishing a load of red scarves and shawls. I knew beforehand that the weft on these items bled copious amounts of fugitive colour and it needed to be dealt with in the wet finishing. If all I had done was wash this load of cloth, there would have been a significant amount of dye left in it and any friend or customer who owned one might have had a really nasty surprise when they tossed it into their laundry. So no, wet finishing isn't 'just washing'. Wet finishing means that if there is fugitive dye, it is - as much as humanly possible - removed. Wet finishing allows the yarns to shift to areas of least resistance so that weave structures like lace weave, deflected double weave, honeycomb, waffle weave and others will develop to their finished state. Textiles that rely on shrinkage differential will not look anything like they will coming off the loom and after wet finishing. Wet finishing may be much harsher in terms of water temperature or agitation than simple washing. Other processes such as a good hard press (which these scarves and shawls will receive tomorrow) or brushing (to raise a nap, usually on wool) are applied during wet finishing. Once the web has been brought to it's 'finished' state, every rule you ever learned about cleaning that textile kicks into play, especially for wool. These shawls and scarves went through a standard wash cycle of 8 minutes with gentle agitation and spin, warm water wash, cold water rinse. I used four rinses. The three Color Catchers on the left went through two rinses and the wash cycle. The medium coloured one in the middle went through three rinses. The two on the right went through two rinse cycles. The washing instructions that I will attach to the items will read "Wash separately in warm water, dry until damp, press if desired." Quite a different process than the wet finishing I just applied. Plain weave doesn't have to be 'plain'. And 'simple' isn't always 'simple' to achieve. One of the things that endlessly fascinates me about constructing textiles is how the layers can be peeled away, revealing another dimension of the craft. It is the very exploration that keeps me getting out of bed of a morning, wondering what discovery will be presented today. Sometimes it is how colours interact. Sometimes how different textures can be created. Either by texture in the yarn itself, or through how the threads interlace. When I first started weaving I was particularly interested in weave structure. My former favourite colour was white - usually on white. And the 'interest' was in how the threads moved, combined, shifted as they made their way through the cloth. I never really got comfortable with weaving plain weave until I got comfortable combining colours. In many cases, the 'best' way to combine them was one on one - plain weave. The colour blending became pointillist with one pixel of colour next to the next, next to the next. Distance or scale then helped the colours blend completely or with contrast even shift the perceived colour into something else entirely. As I wove more plain weave I got better at doing it. Plain weave is so consistent that every little inconsistency will show up. Especially when using two different colours, warp and weft, even more when those colours are of high value contrast or across the colour wheel from each other. I had to get really good at paying attention - to my beat, to advancing the warp frequently, to re-tensioning the warp after advancing. Weaving plain weave is now comfortable for me - although I'd be the first to admit I'm still not perfect. But I also know that tiny inconsistencies will usually disappear in the wet finishing. And what better reason can there be for wet finishing - to hide the slight imperfections and make us look more 'perfect' than we are. So no, I'm not the least bit concerned about the reed marks in the web. I know they will, by and large, go away once the shawls are wet finished. When I first took up weaving, intending it to be my profession, I resented the fact that the stereotype of a weaver was a little old lady in running shoes. The above photos are from a conference held in Victoria, now a very long time ago. How do I know? I was a brunette. It may have been 1984, but memory fails on this one. I taught the first workshop ever the month I started weaving class. The fact that it was a spinning class and I knew very little about spinning was kind of incidental. I knew more than the others in the room and that was all that mattered. But I had my first taste of what it would be like to involve myself in this world of teaching about textiles. Since then I have run the gamut of being valued...and not. I have stories. Oh my yes, I have stories. Dini Moes used to say that 'comes from far away, tastes better'. And that seems to be in large measure true. For a great many years very few people in my home guild had any idea that I was traipsing all over the continent teaching. Not only that, but my expenses were paid, I was housed in comfort, people were interested in what I had to say. At home - well, I was just me, doing what I did. I almost never mentioned when I had an article published in a magazine, or was attending a conference in order to teach there. I didn't want to boast, or make it seem like I was anything other than just me, doing what I wanted to do. But eventually people started to find out what I was doing. That when I flew off to parts far away, it wasn't that I was going on holiday, but...working. At one point the program person for my guild asked if I would present a program. I looked at her and said that I would but that I got paid (at the time) $50 to do a guild program. She literally gasped and sternly informed me that "we don't pay for programs!" I looked at her and said "Yes, you do. Every out of town teacher who does a guild program gets paid. I get $50 - or more - for doing a guild program." She sputtered and finally sniffed and said that she would have to get approval from the board. "Fine" I said. "Let me know what they say." Eventually she said they would pay $25. I agreed. I would, after all, be sleeping in my own bed, no travel involved. The night of the guild meeting, I impatiently waited while the guild business was done. I'd told the program person I did an hour long presentation, and I watched the clock ticking away. Finally they wrapped up the business and because it was getting late, some guild members left before I started. At the end of the hour, I collected up my samples and other teaching aids (including my own slide projector) and program person brought over my cheque. She stood there, awkwardly, finally said that the program had been excellent. She hadn't expected that. Inside I died a little, firstly because she had not expected me to do a job worth $50 and hadn't, therefore, fought for my right to earn the money. Secondly because she had been a teacher and her words saying she had expected me to 'fail' in her estimation cut, most especially since I'd already told her that I earned an income by doing this very sort of thing. Did she think I was just that bad, or that other guilds were that gullible? I didn't know. I looked her in the eye and said something to the effect that this was how I earned an income and doing this sort of program was just part of it. Over the years I've taught at a number of conferences, again, all over the continent. ANWG was the first, then local/regional gatherings, but also Mid-West, NEWS, OHS and ATQ among others. I have also taught at Convergence. Some of them have been miles ahead of others in terms of how I was treated. Some of them have been miles behind. My attitude is that, without instructors, all you have is a giant shopping event with perhaps an exhibit or two thrown in for good measure. People who teach at conferences are - by and large - professionals. Do they earn the entirety of their income from teaching? Not likely. Usually they will write and sell things as well. But they do take their commitment to teaching seriously. Time and again they are asked to work for less than they might otherwise wish to do because they will get 'exposure', they will 'build their resume' by teaching at such a well known event. They will benefit in the future by participating. Well, I'm done with that. I gave up adding prestige to my resume back in the 1990s. Where I live, people die of 'exposure'. Teachers are frequently required to finance the event by buying their flights and carrying that debt for weeks, sometimes months, until the event happens and they finally get paid. I think it's shameful that teachers leave an event without their pay and we will be moving heaven and earth to make sure that all the teachers leave Prince George with their pay in their pockets. I am also building into the budget compensation for things like checked baggage (because what teacher ever travels without at least one checked bag, full of samples?) and shuttles to/from the airport. We will be paying a per diem for food. Which means we will give them an allowance that we will pay for each day, no questions asked. If they want a glass of wine or beer at dinner? None of my business. No receipts will be required to be submitted, no questions asked about their food choices. They will be given a room at one of the hotels, material fees will be collected at the door by an assistant and handed to them directly. They will not have to go get the money because - in my experience - they will be busy getting the room set up the way they want it, organizing their samples, their audio/visual presentations (if they are using them). All too often it has come time to begin and I have not collected the material fees and I don't want to spend presentation time trying to collect them. I have just absorbed the expense, even when it may have been a really hard lump to swallow. My philosophy in working on this conference is to treat ALL the participants with respect. That includes the vendors, the exhibitors, the volunteers and... the teachers. My goal is to have everyone enjoy the event as much as possible. Our schedule will allow time for socializing - because all too often people say they didn't manage to connect with everyone they wanted to because there wasn't enough time. Or they never did make it to one of the exhibits - because there was not time. Our conference will be held in a very small geographical location - the Civic Centre, library, art gallery and the two hotels are in a three block by three block area. All buildings are accessible, all buildings have elevators for the upper floors. All buildings have a/c, although it's rarely required in June, here. If I do nothing else in this life, I hope to help bring this conference into being by treating everyone fairly. It may very well be the last conference I choose to attend. I want to make it a good one. Over the years I've seen the debate on tensioning or not tensioning a warp during beaming. One view is that beaming with zero tension is 'equal' tension. Unfortunately while that may be correct, it is not particularly helpful in many instances. Let's say hypothetical weaver has been weaving with 5/2 cotton, mostly short warps - 5 yards and under. And beams with zero tension and has perfectly satisfactory results. Let's say that said hypothetical weaver wants to up their game and decides to use that 5/2 cotton and make a run of tea towels, decides to wind a warp of 15 yards and beams it with zero tension. This may not work so well. In my experience, the longer the warp, the more tension it needs during beaming. I have written elsewhere about my experience beaming 14 meters instead of my usual 11 meters and how tension issues cropped up during weaving as the yarn slithered and slid unevenly as I wove. I added four cups of water to each jug I use for weight and voila, no more tension issues with the successive warps. A Swedish friend commented that the guideline in Sweden is that for every additional 10 meters, you need another person to pull tension on the warp while beaming. In my experience, changing from one yarn to another of a completely different nature may mean beaming with zero tension doesn't work well any more. For instance, changing from that tried and true 5/2 cotton to, say, linen. Or silk. Or a very elastic wool. Or a very slippery yarn like rayon. And suddenly, beaming with zero tension may not look like a very good practice after all. It can also depend on how much tension is applied during the weaving itself. Something like linen that requires fairly high tension during weaving may mean increasing the amount of tension during beaming. In my experience, the warp needs to be beamed with at least as much tension as will be used during weaving. So for those weavers who don't use any tension at all during beaming, be prepared for things to change when the parameters of the 'usual' warp change - like warp length or yarn being used. In terms of where to start? I use about half a gallon of water per jug for my 'usual' warp of 11 meters. I use old bleach bottles because the plastic is a much heavier grade than a water or juice bottle. In the picture above one of the jugs has to be at least 25 years old, the other is newer because the cap failed on the other one I had been using for about the same amount of time. Currently reading Sunshine and Rhubarb Wine - a memoir of a friend's mother who lived for 105 years. "One reference says it has to do with the blacksmith trade. A skilled blacksmith has "a well-trained apprentice who maintains such control of the bellows and the placement of the irons that each is ready in turn at the anvil and hammer...'Too many irons in the fire' would mark an inefficient smith or one with an unskilled apprentice. Figurative use of either saying takes us back only to the middle of the sixteenth century." From "2107 Curious Word Origins, Sayings & Expressions from White Elephants to a Song and Dance" by Charles Earle Funk (Galahad Book, New York, 1993)." As a self-employed craftsperson, I frequently have many irons in the fire. Just now for example? Craft fair production. With the craft fair season beginning in October, I have had to keep an eye on my inventory of hand woven textiles, try to gauge how many place mats, table runners, tea towels, scarves and shawls I might possibly need for the three shows I am doing this year. I need to have sufficient selection of colours and designs to appeal to a variety of people. Too little and there isn't enough choice. Too many? There is never 'too many'. Ever. So I am pressing forward trying to increase my inventory of shawls from zero to...something...and scarves to a better selection of colours. Conference planning. We have been working on the conference for several years, lining up facilities, lining up presenters, working on event details. Teaching. This year I taught four Olds classes, one on the west coast, two on the east coast, one in Alberta. There was marking to be done and I am waiting for the last box of homework from 2018 to arrive in order to mark that one. I also taught a 5 day class on the east coast and will teach one two day class plus guild program next month on the west coast. All of those classes required preparation, about two days prep for each class. No matter how many times I teach a class, there is always about two days prep for each. Not to mention doing travel bookings. Writing. I write for this blog frequently - sometimes every day. I also do the posts for the conference blog and other marketing such as the Facebook page for the conference. For the past 5 going on 6 years I have been working on the book manuscript. 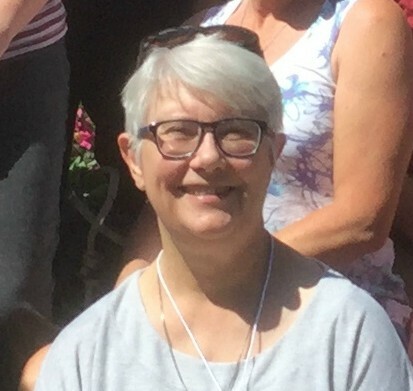 Right now the ms is in the able hands of an editor I trust, partly because her job is editing technical writing but also because she is a weaver and spinner and will not be gutting the ms of the stuff that I think is important. We hope to hit publish on Dec. 2. I have also contributed to a Handwoven 'look book' - two in fact, just submitted an article for SS&D (which may - or may not - be accepted - but I still spent a couple of days writing it) and will have another article in Handwoven's upcoming issue. And all of the past two years I was dealing with cancer related fatigue, then adverse effects of the 'miracle' cancer drug I am now taking daily. I have been doing this and many other things (weaving for a fashion designer for nine years, dyeing and retailing yarns, writing and publishing Magic in the Water, achieving the master certificate from the Guild of Canadian Weavers, etc.). I call myself a professional because this is how I earn my money. But. But. I am now 68 years old in, shall we say, not exactly robust health. When I started weaving I thought I would weave and sell my work for 25 years, which would bring me to the age of 50. Then I would teach for 25 years. Instead I did both, right from the get-go. I find that I'm tired. I'm tired of being a travel agent, tired of dealing with flights with tight connections, tired of, quite frankly, selling myself. Taking the cancer drug just makes me tired, period. But I am also not done with weaving. I have a stash that seems to go on forever and I really don't want to leave a weaving 'estate' that will be a burden for my family/friends to deal with. I've heard of way too many stories of stashes that take up entire houses, or that get loaded up and taken to the dump. I want to use up my yarns, not have them go into a land fill. I want to see some of the ideas floating through my head come into physical reality. I want people to find my work attractive, enough to pay for it to grace their homes and wardrobes. So I have, over the past couple of years, begun removing some of the irons from my personal fire (energy well). I have begun calling myself semi-retired. I have begun to conserve my energy for the things I find important, now. I no longer have to scramble for income every month. My house is paid for, my wants are few. For the next year there will be four classes of homework to mark (I don't expect every person in every class to submit homework, but four classes of 10-12? That's a lot of marking.) There may, or may not, be four classes next year (I doubt that all four will proceed to the next level, but you never know.) There is the conference. There is Olds Fibre Week - for which I may - or may not - be asked to teach level one again. One of the things that outsiders don't understand is the level of uncertainty involved in being a professional teacher/weaver. With such a high level of uncertainty about events going ahead - or not - my strategy has always been to grab onto every opportunity presented to me, then scramble like mad to meet the deadlines. For the things that get cancelled? I would focus on the next. And sometimes be grateful for the cancellation so that I could take a deep breath and carry on. Well, I am tired of that, too. At 68, after a life time of scrambling, I get to step back. I get to step aside and let other, younger, people take on the writing, the teaching, the space at the craft fairs. Because everyone has something to contribute. None of us are the same. We all have different experiences, different approaches to creativity/design. We all have ourselves to contribute to the community. It has been a struggle to accept that I am tired. But I am. And that's quite ok. As they say in Newfoundland - it's been a time. And hopefully will be for some time yet. When I helped organize conferences previously (1980, 1985, 1995) there were few resources other than pencil, grid paper and a very large eraser. By 1995, I had a personal computer, but there were very few tools for conference planning - in fact we had a registration program custom written for us to use. But spread sheets were rare and we scheduled workshops and seminars the old-fashioned way. This time? Things have changed. We also have more resources on the ground and are taking full advantage of them! The Civic Centre can hold 500 (plus, but we need to reserve some seats for the vendors and guests) and we are planning as though we will fill all of those seats. Registration will be done on line, which will take an enormous load off of the committee. Instead of continually crunching numbers, the site will track registration, give us seat counts for the various events, and just generally make our life a whole lot simpler. In addition, the site will collect the fees so we won't have to be trekking to the bank to make deposits and such, dealing with foreign currency, etc. We have spent a good portion of the summer honing the schedule, selecting workshop and seminar topics we think will be of interest to people, scheduling the instructors into rooms at the various facilities. We are renting workshop/seminar spaces at the art gallery, the library, the Civic Centre and the Coast Inn of the North. The Courtyard Marriott will have the exhibit and one seminar room, plus some other smaller events, most likely the author signing and special interest groups who wish to meet. The entry forms for the author signing, the fashion show and the general exhibits are being reviewed and should go up shortly. With so many people out of town during the summer (some of them simply trying to avoid the pall of wildfire smoke), things got delayed a bit. Personally I will be stepping back from the conference planning for a few months while I deal with personal deadlines, including (hopefully!) 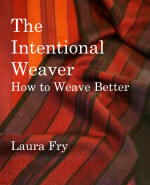 publishing The Intentional Weaver. Once registration goes live it will be time to start sorting out the fine details and I will be back in the thick of it again. Yesterday I posted about yarns that are 'tender' and need special handling. This yarn is not tender but it still needs special handling. Even though it was stored in a plastic bag, the bag was loose and during transportation, the coils of yarn around the cone loosened to the point where it was pretty much impossible to find the end of the yarn, and trying to unwind it would have turned into a nightmare of snarls and tangles. In the end when I gently grabbed the snarl of loose coils and gently pulled them off the cone and onto the table, there really wasn't all that much in terms of yardage - certainly well under an ounce of this 16 ounce cone. Stripping the loose yarns off the cone took less than a minute, the value of the yarn was very low and many minutes of my time (not to mention the frustration of trying to salvedge it) were saved. I used to work with this quality of yarn all the time when I wove for the fashion designer. In point of fact I bought this yarn from her when she decided to retire and close down her business. So I knew what I was getting in terms of quality - and behaviour. In order to keep the yarn well behaved I got a bunch of net scrubbies and kept them to put onto the base of the cone. I cut them long enough to pull up over the cone for storage, but they need to be pulled down to the base or else there is too much friction and the yarn won't feed off without a lot of tension being applied to the yarn. The scrubbies prevent the yarn from slithering down the cone and wrapping around the base so that as you are winding it catches and snags. They are also quite elastic and as the diameter of the cone reduces, they simply shrink to accommodate the smaller size. I finished winding the warp with this yarn with no problems. There are other things that can be used in similar fashion - old pantyhose, for example. Currently reading More Bitter Than Death - remembered to look up the title of the Dana Cameron book I'm nearly finished. At a recent class I talked a wee bit about working with 'tender'* yarn. About how more twist will make a short staple fibre (like cotton) stronger. But that with the addition of more twist, absorbency will be compromised. Short staple is one thing that will contribute to a yarn being 'tender'. A longer staple fibre will produce a stronger yarn - if all other things are equal - than a shorter staple fibre. Examples would be things like quiviut, cashmere, cotton. A singles yarn will be more tender than a plied one. A thinner yarn will be less strong than a thicker one. So, when working with a yarn that is likely tender, can you use it in a warp? Well, yes, but you need to treat it more gently than a stronger yarn because it is, by it's very nature tender. Winding the warp there should be less tension applied (most weavers hold their yarn way too tight anyway, but really important to wind with only just enough tension and not very tightly). Beaming the warp, wind more slowly, carefully straighten out any areas with slack tension, finger comb gently rather than use a brush or comb. To weave, set the tension on the warp as low as it can be effectively woven with. When advancing the warp, try to re-apply the same low tension. Stay carefully within the 'sweet spot'. Do not weave too close to the reed as this will place too much stress on the yarns and they can break. Beat once, gently. Do not bang away at the fell or double/triple beat. Keep your bobbins on the skinny side rather than fill them full to maximum capacity. Use a sizing if the yarn is really softly spun or - if you haven't used a sizing prior to beaming - use a sizing that can be sprayed or painted onto the warp. The cheapest hair spray works well on many fibres, like cotton and rayon. I wouldn't use it on silk. Many yarns have special 'needs'. Weave a sample before plunging into a long project to find out if the warp chain should be sized before going into the loom, test how much tension the yarn can withstand, find out where the sweet spot is and get comfortable with advancing the fell frequently. I keep two planning calendars - one for this year, one for next - to record events and remind myself of deadlines. Even though I am cutting back on teaching by no longer accepting guild workshops, it seems I still manage to fill my calendar with dates. These are just the potential teaching events coming up that I know about. Of course they all depend on getting sufficient students to 'go'. Olds Master weaving level 2 and 3 in Cape Breton in May, the conference here in June, for which I'm scheduled to do three seminars (in addition to the organizational duties of co-chairing - which ought to be pretty much over and done with prior to the event - one most fervently hopes), Olds level one (I haven't been asked yet, but I'm reserving the dates in case) and John C. Campbell again in September. In addition to that I have craft fairs in October and November - how many and where are yet to be decided. I'm old enough now that I tend to reserve that decision until after this year's shows. Technically I have Jan-April for production for next years shows. Which really doesn't leave me a lot of time to do much in the way of designing new lines. So I expect that I will extend the current line of scarves I've been working on, maybe come up with a new kitchen towel design, finish the tea towel warp on the AVL and do another (mostly) natural white warp in order to use up the cottolin (already have that pretty much designed - another Snail's Trails and Cat's Paws to sell at the ANWG conference where I will also have a booth - and thank you to Doug for manning it). I have come up with a shawl design which I may crunch today even though I have six more scarf warps already wound. I am 'out' of shawls and really ought to have some to offer. Today I need to write a 1200 word article for publication. It has a really tight deadline and I need to find my words rather quickly or I'll miss it. And it's for a magazine I haven't written for in quite a long while - plus they have agreed to mention The Upcoming Book. It's an opportunity I don't want to fumble. Currently reading - oh the book is in another room - author is Dana Cameron. A 'light' mystery that is just about the right degree of engagement. I'll look for other of her titles. Seems she also writes urban fantasy type books, too. This was the first time I'd been at the the John C. Campbell Folk School in September and it was quite different from the previous times in Jan/Feb/March. The mornings dawned with mist and heavy dew on the grass, but it was in the 90's(F) during the day and very humid. The studio is air conditioned and at times, walking out of the studio into the thick air outside was a bit of a shock for this northerner, but the walk between the studio and the dining hall was a welcome break from the thick concentration in the studio. My cough and voice improved over the week and we decided that I had not actually caught a cold but with all the 'adventure' of the stressful flight, spending hours upon hours in airplanes and airports, then the off-gassing of the new windows and caulking where I was staying, I had been having a massive allergic reaction. I may have a touch of bronchitis, but will wait a few days and see if it all settles down. The cough is much improved and I'm hoping that now I'm home it will go away entirely. Speaking of which, the fire situation is also much improved here and with cooler temps and some rain, the provincial State of Emergency has been lifted. The class The Efficient Weaver is not a particular topic as such but an opportunity for students to come and hopefully fill in the holes in their foundation of knowledge. I have been teaching this class in one form or another for the folk school since 2011, I think. What I present is much of what I teach in level one of the Olds Master Weaving level one. So if people are interested in upping their game but don't want to take the Olds program, they could come to this class, which is less stressful, partly because I'm not teaching to a curriculum and there is no homework. Now, I don't cover ALL of the Olds curriculum, partly because there is no curriculum and there is no homework! What I hope is that students will come in at whatever level of knowledge they have and maybe learn something new to increase their knowledge. But most of all what I hope is that they begin to think through their process. The 'think-y' part of weaving as some say. While it isn't necessary for people to do this, if they are interested in understanding the why of the process, figuring out what is best for *them*, I hope this class will begin to shine a little light and that they can then go home and continue the exploration,. What I love, and why I keep tackling these long/stressful journeys, is to see the ah-ha moments and the light that shines when people 'get' what I'm trying to tell them. One student had never studied with an actual teacher, but had only had access to books, DVDs and You Tube. Her warp was tensioned so tightly you could bounce a quarter off it and I suggested she loosen her tension - by quite a lot. She was doubtful and hesitated, so I told her to do it gradually, just one notch less each time she advanced the warp, until it was too loose, then start tightening it again until she found a level of tension that worked. She was very doubtful, but by the end of the week her cloth no longer was so stuff it could stand in a corner, her selvedges had improved and her beat become even more consistent. Sometimes you just need to have a little feedback and encouragement to try something a little bit different. So when I left, I had left a signed contract for next year - Sept. 8-14. Because helping people understand the process and how they can apply it to their own practice is what makes my heart sing. And in the future I will pay less attention to buying the absolutely cheapest flight and try to find flights with longer layovers for connections. And avoid O'Hare if I possibly can! We are using Mary’s dining room table as a staging area. Mary is the best studio assistant ever(TM) and has gone out of her way to run and fetch things for the students. I packed very light for this trip so I don’t have a large suitcase filled with materials and gewgaws like I usually do, plus I was running low on Mason’s line for lashing on. On top of everything else, the stress of missing my flight, having to stay overnight (an unbudgeted expense), then multiple flight delays and at least four gate changes sending me chasing all over O’Hare airport, and I came down with a cold. Too late to cancel now, we stopped and got boxes of tissues, hand wipes and masks for anyone who wants to keep my bugs at bay. I will wear one when I’m not lecturing but my voice is weak and a mask will further muffle my voice. I am feeling somewhat better today so I’m hoping it won’t last very long.